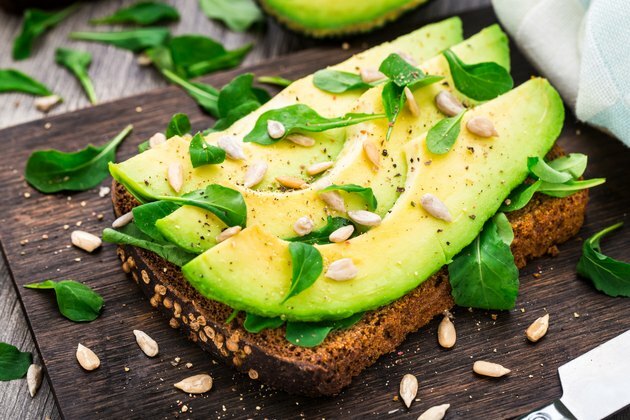 It may sound strange at first, but avocado -- with its healthy unsaturated fats and creamy texture -- can replace oil or butter in many baked goods. According to "Shape" magazine, using avocado to replace some of the oil in a cookie recipe made the cookies softer and less crumbly than making them with all oil. And because avocados have fewer grams of fat per tablespoon than oil or butter, using them in your recipe can cut its overall fat count. You can replace up to half the oil in a recipe with mashed or puréed avocado. Mash the avocado well. To achieve an oil-like consistency, the avocado should be smooth as possible. You can mash by hand or use a food processor. Under-ripe avocados may be harder to smooth out, so let yours ripen for a few days after purchasing; they should feel a little mushy from the outside before you use them. Replace half the oil in a recipe with the mashed avocado. Replacing all the oil with avocado might make the avocado taste more noticeable in the finished product or have an adverse effect on the texture. Follow all the recipe's other instructions, using the avocado-oil mix as you would with pure oil. If you have unexpected results, make a note of them for next time; for example, adjust cooking time as necessary if the baked good comes out under- or overcooked. Savory baked goods, such as muffins and other quick breads, are a good way to start using avocado in recipes; their flavor won't overwhelm the finished product. Avocado is also a good complement to chocolate dishes, according to the California Avocado Council. What Can You Substitute for Oil While Baking a Cake?